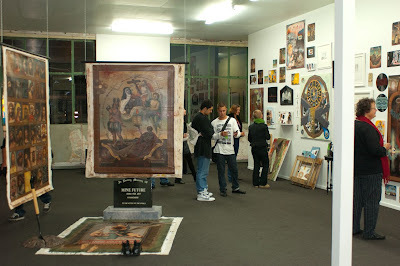 Tomorrow is the last day of my exhibition, BYO: Hasta Luego Matt Couper at PAULNACHE in Gisborne. If you haven't gotten around to it yet, you can view the exhibition here. The exhibition features over 140 works dating back to 1998 and provides a visual chronology from my first group show in Auckland in 1999 to my most recent work featured in Represent at PAULNACHE in March this year. Below is a photograph to show the scale of some of the works and the installation as a whole. Somethings it's near impossible to get a good idea of the size and dimensions of specific works and installations.